Pop stars, rock stars, actors and bands have all been enticed by our delicious food, friendly and professional approach and ultra-efficient logistics services in often unusual locations with a non-traditional supply chain! Loved by rockstars and requested by crews all over the world, Eat to the Beat is the foundation to Global Infusion Group. From our first tours with Joe Jackson and Iron Maiden in 1984, to feeding the masses backstage at Download and V Festival. These days, over 30 years later, we’re recognised and requested across the music, festival, TV and film industries by some of the hottest professionals there are. From Alicia Keys and Wet Wet Wet, to nearly 20 years of catering for Coldplay and their crew. From Cirque du Soleil to Strictly Come Dancing and The X Factor, we work our way from location to location on film and TV shoots to worldwide music and production tours, from one off major shows to multi-night dressing room riders. We are known on-site for our smiles, our memories and most importantly, delicious and freshly cooked food that creates a home from home feeling (and flavours!) with a slick operation behind it. 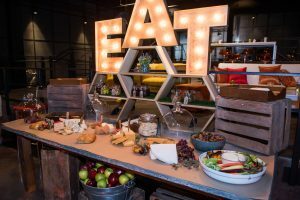 Eat to the Beat’s reputation as a highly experienced world-class live catering operation dedicated to delivering first rate hospitality to artists, production and crew members in the Film & TV industry continues to flourish. Our list of credits has grown considerably in 2018 and in the last few months alone, the company has delivered catering on-location and to high-profile studios for numerous production companies and TV shows. Eat to the Beat can work from an onsite kitchen, bring along our own kitchen trucks or deliver hot boxes for 10 – 500 people. The feedback the team receives from our clients is excellent, with comments ranging from how fresh and delicious the food is, to the variety of dishes on display and our ability to cater for all diets and tastes. Eat to the Beat’s team, whether office based or out on the road are all incredibly hard working and will go out of their way to look after every client. A lot of the company’s work is repeat business from regular clients who continue to enjoy our reputation for reliability, friendliness and quality of service, firmly believing that our people are the recipe to our success. Whether your idea of a good breakfast is a classic bacon butty or you’re a breakfast burrito kind of guy, Eat to the Beat will deliver exactly what you want. Working closely with approved suppliers we use responsibly and locally sourced produce. No matter your preference or budget, Eat to the Beat’s food is always really tasty, cooked with love and served in a home from home environment. Attending a UK music festival? We’ve probably been there… including Reading Festival for over 30 years! Festival catering requirements are often based on the demands of the task in hand. If you’re onsite working at a festival with crew who’re working long hours, doing a physically demanding job, then they are going to want more hearty, comfort type food. Whereas artists, who’re about to perform, will want lighter healthier options. It’s all about knowing and understanding who you’re preparing the food for. Our approach to service is holistic – it’s comforting to see the same warm and friendly smiling faces who know they’ll find the biscuits next to the coffee machine – rather than having to navigate a whole new set up every day. We see ourselves as an extension to our clients’ teams rather than an addition. When it comes to catering on tour, we very much see ourselves as providing a home from home on the road. We’re well versed in how to prepare food for very specific taste and diets. Working all over the world with athletes and artists who are at the top of their field ensures that we’re ready to deal with literally everything and anything. We’ve cooked food for people who are committed to super strict diets to those who don’t like furry fruits! We’ve found in recent years that most events have a wide array of dietary requirements, so we offer vegan, gluten free, halal, nut free, high protein, low carb, low sugar etc. Menus are planned to be inclusive so there is always something that the main restrictions are able to eat rather than people feeling that they’re being singled out as having special requests. IS VEGANUARY PAVING THE WAY FOR A MORE PLANT-BASED 2019? ‘Veganuary’ will be upon us once again; is it now proving as popular as 'Dry January'! A nutritionally balanced diet is crucial for performance levels of the athletes on Cirque tours. Is a ban on single-use plastics at festivals a reality? Eat to the Beat on tour with Dua Lipa! Tour catering company of choice! For 34 years, Eat to the Beat has been catering for artists at Festival Republic’s Reading Festival and this year’s three-day music festival was no exception. Artist, production and crew catering specialists Eat to the Beat delivered food and refreshments for dozens of rock and heavy metal artists at Download Festival 2017.